CD review: "All My Life"
This review first appeared in the May/June 1991 issue of Living Blues magazine. Two years ago, Alligator Records' reissue of "One More for the Road" brought Charles Brown back for those of us who had not been fortunate enough to catch him on one of his interminable tours. It was a stellar album and contributed to a renaissance of Brown's career. 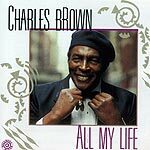 Brown's recording comeback was no one-shot affair, and "All My Life" is every bit as engaging and rewarding as "One More for the Road." Brown's distinctive, smooth-as-Kentucky-bourbon vocals still create a magic that sounds like no other artist; his piano and organ playing are still polished without losing touch with the earthier side of the music. The material on the current release displays a broader range of styles than the 1989 album. While the songs on "One More for the Road" were nearly all the sophisticated, jazz blues that Brown excels at, here we get everything from a rowdy R&B duet with Ruth Brown ("Tell Me Who") to a straight-ahead jazz piece ("All My Life"). Brown borrows some standards ("Bad, Bad Whiskey" and "Nobody Knows the Trouble I've Seen"), remakes some of his own past hits ("Seven Long Days" and "Trouble Blues") and contributes several new songs ("Tell Me Who" and "Joyce's Boogie"). Whether Brown wrote the song or is remaking someone else's, though, the result is the same: once he touches it, you will forever associate that song with Brown's rendition. Brown's side musicians here are an interesting group, and contribute heavily to the excellence of the result. Dr. John (Mac Rebennack) provides some fine piano and organ accompaniment as well as a vocal duet ("A Virus Called the Blues"). The vocal duet doesn't work as well as the instrumental work, perhaps because Rebennack's singing style is so close to Brown's. Longtime Brown contemporary and friend Clifford Solomon lays down some mean sax work throughout. Highlights of Solomon's contributions are "Fool's Paradise" (wherein Solomon comes close to capturing Brown's vocal style with his tenor horn) and a loose jam with Brown and guitarist Danny Caron on "Joyce's Boogie." But it is the duet with Ruth Brown that marks the musical zenith of "All My Life." A Charles Brown composition, "Tell Me Who" features a catchy melody and the equally fetching technique of separating the short vocal passages with drum breakouts and horn choruses. NOt only is this one of the prettiest melodies he has written in four decades of composing, but both he and Ruth Brown give this song the raucous treatment it deserves. The liner notes by former Atlantic Records executive Jerry Wexler are informative without being heavy, and the recording quality is excellent. this is, from top to bottom, a superb release.